In yesterday’s Life for Leaders devotion, we saw how the first chapters of Genesis begin to paint a picture of servant leadership. Human beings are to exercise dominion over the earth (Gen 1:28) and also to “serve” the earth (Gen 2:15, translating the Hebrew verb ‘avad more literally than “till”). There are fascinating implications of the use of ‘avad in this verse. I don’t mean to suggest that the original writer consciously anticipated all of these. But as we reflect upon the nuances of ‘avad, we discover truths about our work and leadership that are quite striking. The verb ‘avad in Hebrew is related to the noun ‘eved, which is the basic word for “slave” or “servant.” This word group suggests not only humble service to a master but also hard work. This is not the hard work that comes after sin, with thorns and thistles; rather, it is the hard work that uses well our capabilities and leaves us feeling valuable and fulfilled. God made us for this purpose. Work, even demanding labor, is not a result of sin and the Fall. Rather, it is at the center of God’s intentions for us. The verb ‘avad has another sense in the Hebrew Bible. It is often used in reference to service to God, that which we call worship. Take Psalm 100:2, for example. The NRSV reads, “Worship the LORD with gladness; come into his presence with singing.” The Hebrew verb translated here as “worship” is ‘avad. The use of this verb in Genesis 2:15 does not imply that we are to worship the garden, of course. But it does enable us to catch a glimpse of something we will see more clearly later in Scripture, namely, that our daily work can be an expression of worship to God. Thus, in our work, Genesis 2:15 suggests that there are elements of servanthood, effort, and worship. Though you and I might not be working the soil today, may we do our work in light of God’s intentions for us. 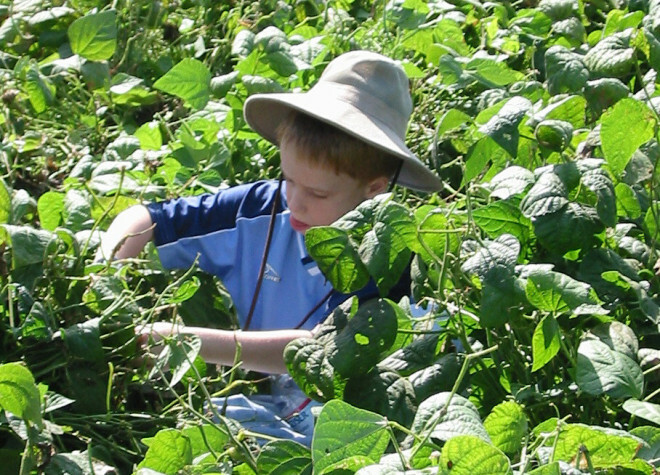 Photo of my son in 2001, on a gleaning field trip in a bean field in Irvine, California. How do you relate to the various nuances of the verb ‘avad? In what ways does your work demand real effort? In what ways might your work be an act of worship to God? Gracious God, thank you for the privilege and calling to work in your world. Thank you for times when I work hard, using well the capabilities and opportunities you have given me. Thank you for the joy of seeing the fruits of my labors. Thank you also that my work can be a way of worshiping you. May I offer you my work today, every bit of it. No matter what I do, may I seek to honor you in it. May my work contribute to your greater work in this world. Amen.